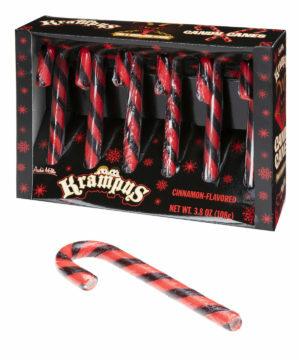 Krampus Candy Canes: Smoky cinnamon candies named after the demon of Christmas. Put a deliciously dark twist on the most wonderful time of the year and enjoy Krampus Candy Canes. Named after the horned Christmas demon that punishes naughty children in eastern European folklore, these sweet canes have a smoky cinnamon flavor inspired by the fire and brimstone that Krampus calls home. The tasty but unusual flavor combined with the black and red striping ensure that these treats will make your days scary and bright.